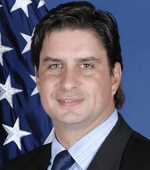 Lev J. Kubiak – Director of Intellectual Property Rights Immigration and Customs Enforcement (ICE) - Homeland Security-Washington D.C. Lev began his investigative career as a Special Agent in the U.S. Customs Service’s Detroit, Michigan office. Prior to joining the Federal government, Lev was an adjunct faculty member at George Mason University (GMU) in Fairfax, Virginia in their Department of Public Administration and taught courses in international relations and international political systems. He received a Masters degree from GMU and a Bachelor of Arts from Mercyhurst College in Erie, PA. Throughout his career he has received several awards including the Customs Leadership award in 2003, the Customs Ensign (U.S. Customs highest award) in 2004, and in 2005 was recognized by President Bush for his contributions to the Security and Prosperity Partnership trilateral negotiations between Canada, Mexico and the United States. Prior to his current assignment, Lev served as Special Agent in Charge for ICE in Buffalo, NY.